President Trump’s campaign against immigration has made that issue central to U.S. politics — in no small part because of the country’s growing diversity. As immigrants and minorities make up a larger share of the U.S. populace, how will the Republican and Democratic parties respond? Our recent research shows that, at least when it comes to answering emails, politicians aren’t less responsive to immigrants than to native-born constituents. What mattered instead was the constituent’s race. No matter where they were born, or whether they identified as voters, ethnic minorities received fewer responses than whites. We drew our conclusions from a type of experiment that researchers call an audit study. It was designed to determine whether state legislators would respond differently to requests for information from constituents with different demographic characteristics — immigrant vs. native born, white vs. Latino, and so forth. Our sample includes all legislators who publicly provided their email addresses to the Sunlight Foundation, along with all legislators from the state of California. In total, the sample consists of 5,087 legislators from 42 states, or approximately 69 percent of all state legislators. We created accounts from which we sent the legislators emails, written as if from a constituent. Each email contained a simple request for information, such as how a constituent could track the progress of a piece of legislation or information about visiting the state capitol. The experimental manipulation involved changing the constituent’s name to suggest a particular race or ethnicity. The text also varied concerning whether the constituent stated that they were born in the United States or not, and described themselves as voters or not. Overall, legislators responded about 36 percent of the time, which is similar to the response rates in other studies. Two of our results were somewhat surprising. First, we found that constituents who described themselves as foreign-born were as likely to get a reply as constituents who described themselves as U.S. natives. Our emails included no information about whether an immigrant email-writer was in the United States illegally or not, so we cannot say whether politicians are more or less likely to respond to undocumented residents. Nor did it matter much whether email-writers described themselves as voters or not. Legislators might assume that anyone who contacts their offices is politically engaged enough to vote, whether or not they say so. Compared with whites, the probability of a constituent with a black-sounding name getting a reply from a state representative was 3 percentage points lower. The probability for our Latino name was 7 percentage points less likely, and the probability for our Asian name was 9 percentage points lower. That’s on average — but for Latinos, it varied by party. Democratic politicians were equally likely to reply to whites and Latinos; the probability of a Republican legislator replying to a Hispanic constituent was 9 percentage points lower, compared with a Democratic legislator. We can’t say whether this is a result of prejudice or whether GOP legislators assume that someone with a Latino name is probably a Democrat, and less worth their time. In either case, such a pattern could make it more difficult for Republicans to reach out to Hispanics, something that has been a concern for some in the party. On the other hand, both Democrats and Republicans were equally unlikely to respond to a constituent with an Asian name. That may be because Asians and Latinos vote at a significantly lower rate than do whites and African Americans. And while Asians and Latinos lean Democratic overall, significant portions of both of these groups say they are ambivalent about partisan politics and are apolitical. But if both parties fail to engage with this growingconstituency, members of these groups may well have reason to feel less than enthusiastic about politics and to stay away from the polls, making this self-reinforcing. Micah Gell-Redman is an assistant professor in the departments of International Affairs and Health Policy and Management at the University of Georgia. Journalist watchdog CPJ said the office was closed after ISI accused the broadcaster of airing programs “against the interest of Pakistan”. The Committee to Protect Journalism has condemned Pakistan’s closure of RFE/RL’s Radio Mashaal office in Islamabad, calling it a “direct threat to press freedom” in Pakistan. “The order to close Radio Mashaal is a draconian move by Pakistani authorities and a direct threat to press freedom,” said Steven Butler, the Committee to Protect Journalism’s Asia program coordinator. “Radio Mashaal is an important source of information and should be allowed to continue operating without delay,” he said. Butler meanwhile told the Associated Press in an email that the move is part of a pattern of increasing pressure on journalists in Pakistan. “It’s hard to know precisely what prompted the order,” he told AP. “It also comes just after the Trump administration cut off military aid to Pakistan and could possibly be a kind of retaliation,” said Butler. On January 1, Trump accused Pakistan of “lies and deceit” and said the US would suspend up to $1.9 billion a year in military aid until Islamabad moves decisively against Afghan Taliban fighters and Haqqani network militants who he said have found safe haven within Pakistan’s borders. The order stated that Radio Mashaal programming presented Pakistan as a “failed state in terms of providing security to its people,” in particular minorities and ethnic Pashtuns. RFE/RL said Pakistani Interior Ministry officers went to the broadcaster’s Islamabad bureau on Friday and met with the bureau chief and administrator to discuss the closure order. “Radio Mashaal is an essential source of reliable, balanced information for our Pakistani audience,” Kent said. “We demand that their safety be ensured, and that they be permitted to resume their work without fear or delay,” Kent said. The murder of opinion columnist Carlos Dominguez, 77, is currently under investigation after he was fatally stabbed while stopped at a traffic light in his vehicle on Saturday, according to Mexican authorities. Dominguez, who covered politics, organized crime and corruption in his nearly four decade-long career, was slain in front of his son, daughter-in-law, and grandchildren. Armed men stormed the stopped car in the Mexican city of Nuevo Laredo and stabbed the journalist 21 times. Colleagues of the reporter believe the attack was in response to his controversial columns. “For Carlos’ colleagues, there is no doubt that his assassination is linked to his journalistic work,” the organization Reporters Without Borders said in a statement on Jan. 15. The NewsGuild, formed in 1933, represents 25,000 journalists, including reporters and editors at the New York Times, Washington Post and Wall Street Journal. The Los Angeles Times was one of the few major U.S. newspapers whose journalists were not part of a union. The Times had a long history as an anti-union organ. In 1910, a bomb placed by a man linked to a local ironworkers union destroyed much of The Times’ office at 1st and Broadway in downtown Los Angeles. Twenty-one people, including a Times editor and a telegraph operator, died in the blast. Over the next several weeks, the guild will hold an election to select its officers, and bargaining over a contract will begin. Meanwhile, The Times is also grappling with continued management turmoil in the wake of a National Public Radio report that Ross Levinsohn, named the Times’ publisher in August, had twice been sued over sexual harassment allegations. The report also alleged Levinsohn had used homophobic slurs while an executive at investment firm Guggenheim Partners. Tronc Chief Executive Justin Dearborn said in a Friday a email to Times employees that Levinsohn had agreed to take an unpaid leave of absence and that law firm Sidley Austin would conduct an investigation into the allegations. JOHANNESBURG – Authorities in Sudan have seized copies of newspapers and arrested several reporters over articles on “anti-inflation protests” prompting calls from the Committee to Protect Journalists (CPJ) against the harassment.“Sudanese authorities should cease harassing and arresting journalists and confiscating newspapers, and should allow journalists to report on matters of public interest without fear of reprisal,” the CPJ said on Friday. US journalists faced challenges before last year’s change in administration, but the inauguration of President Trump marked a sea change. So ubiquitous were the “fake news” accusations bandied about by Trump and his advisers that the phrase became word of the year in 2017. Journalists who dare to challenge the Trump narrative are frequently attacked as “enemies of the American people” and repeatedly mocked on social media. However, the denigration of independent media is not limited to presidential Twitter trolling. If it were, we might not be visiting the US this week on an unprecedented joint international press freedom mission. The fabric of press freedom in the US has been frayed and weakened by political stigmatisation of journalists and cries of “fake news”, but it risks much greater, and more permanent, damage from other forces, including harassment, detention and criminalisation. Journalists are facing an unprecedented and unrelenting crackdown on their work that appears to come more from the playbook of dictatorial demagogues than constitutional caretakers. This crackdown is at its most visible when it intersects with protest. Protest is free speech’s bedfellow in the first amendment. The protection of freedom of the press sits alongside “the right of the people to peacefully assemble, and to petition the Government for redress of grievances”. Yet journalists covering protests related to the Black Lives Matter movement, the Dakota Access pipeline, and the presidential inauguration have found themselves kettled, detained and charged with offences ranging from misdemeanours to felonies. Photojournalist Tracie Williams was documenting activists at Standing Rock, North Dakota, when police arrived with automatic weapons. Williams was arrested despite explaining to officers that she was a journalist and her equipment confiscated. Williams was only able to retrieve her belongings after involving two lawyers, a local senator, and advocacy groups. She still faces charges. Journalists also consistently report being stopped at borders and having devices seized and passwords demanded. Canadian photojournalist Ed Ou was detained for six hours and border agents searched his phone, made copies of his notebook and refused his entry; editor and photojournalist Terry J Allen was forced to delete photos she had taken at the US-Canada border and questioned when she refused to hand over her mobile phone; and British-Iranian BBC journalist Ali Hamedani was detained and interrogated on arrival to Chicago O’Hare airport in February. Hamedani said his interrogation, and the search of his phone and computer by US border agents, reminded him of when he last visited Iran and was arrested in 2009, saying that it “felt the same”. Targeted harassment, stigmatisation, and detention of journalists fosters an environment of fear that shuts down debate. All these factors feed and fuel each other. Stigmatisation by public officials and politicians gives police and other authorities the impetus and invitation to make life more difficult for journalists, and so the harassment and detention escalate, preventing independent journalists from being able to do their job, which is often by definition a cause of frustration for those in power. It’s a check and balance that is vital to democracy. As international freedom of expression organisations, we’re well versed in talking about these conditions in countries where dictators have held court for decades, but it becomes a global threat when we are having to raise the alarm about tactics employed by an established and influential democracy like the USA. Attacks to media freedom in the USA do not just stop at the borders, whether walled or porous. elan leader, Nicolás Maduro, turned to Trump’s “fake news” defence to brush aside criticism of his efforts at constitutional changes amid an ongoing crisis, and Syria’s Bashar al-Assad dismissed an Amnesty International report on the torture and execution of thousands of detainees as “forged” in the “fake news era”. Aung San Suu Kyi’s government in Myanmar has sought to deflect accusations of ethnic cleansing and reporting of human rights violations against Rohingya people with the ever more popular claim of “fake news”, while conducting a broader crackdown on press freedom, while China’s state news agency dismissed the reported torture of a lawyer at the hands of the state with the same words. What happens in the US within and outside of its borders affects all of us. Our freedom to know, to criticize and to question those who hold power over us is reliant of the free flow of pluralistic and independent information. In our ever-smaller global world, some domestic policy can be felt as keenly abroad as at home. The Trump trend of anger at the press is not just fodder for TV satire. It must be checked. We must all advocate for a flourishing plural and independent media landscape for the US and the world. Thomas Hughes is executive director of Article 19, a global organisation working to ensure people everywhere have the right to freedom of expression and information, and are free to actively engage in public life without fear of discrimination. Jodie Ginsberg is CEO of Index on Censorship, an organisation that campaigns for and defends free expression worldwide. (CNN) Prosecutors in Myanmar have sought charges under its Official Secrets Act against two Reuters reporters, which could see them jailed for up to 14 years, the news agency said. Journalists Wa Lone and Kyaw Soe Oo appeared in court Wednesday, almost one month after their arrest on December 12 while working on stories about the Rohingya minority in Rakhine state, Reuters reported, citing the men’s lawyers. The charges sought are under Section 3 (1)(c) of the act, which “covers entering prohibited places, taking images or handling secret official documents that ‘might be or is intended to be, directly or indirectly, useful to an enemy,'” the news agency said. Family members react as Reuters journalist Kyaw Soe Oo leaves after a court appearance in Yangon on January 10, 2018. 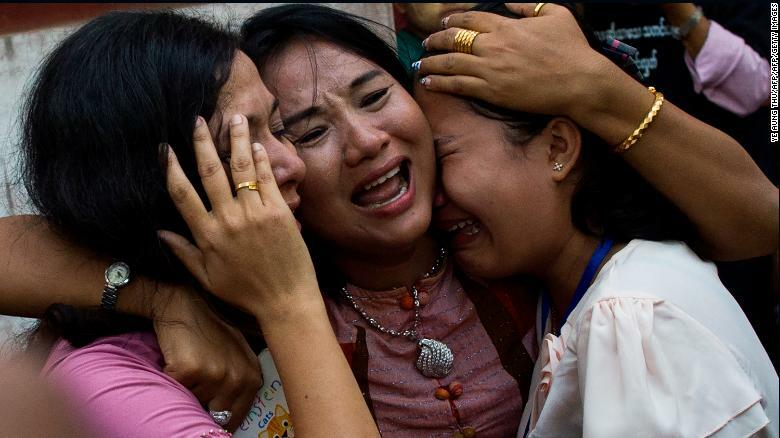 “Our colleagues should be allowed to return to their jobs reporting on events in Myanmar. 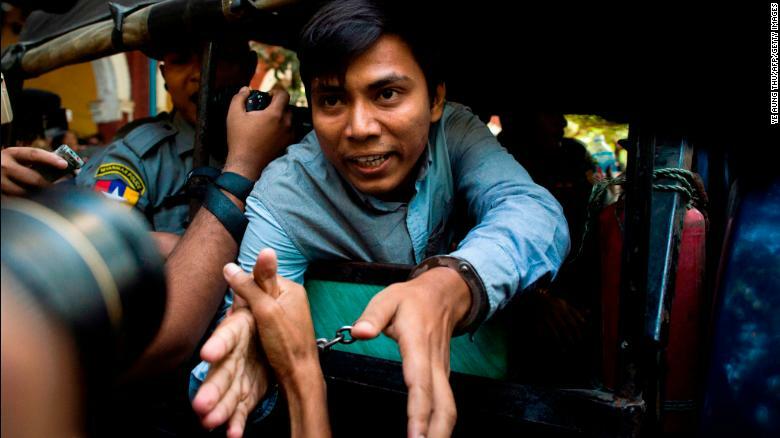 We believe time is of the essence and we continue to call for Wa Lone and Kyaw Soe Oo’s prompt release,” Adler said in a statement. The reporters previously appeared in court in December, but no charges were sought. Following that appearance, they were permitted to meet relatives and a lawyer for the first time since their arrest, the news agency reported. The case has been adjourned until January 23. An image of the two men in handcuffs with their faces partially obscured was published on the Ministry of Information’s page. The two reporters were working in Rakhine State, the location of alleged ethnic cleansing of the Rohingya, the state’s minority Muslim population. The Myanmar government says the army has been conducting operations against militants who attacked border posts. Reuters journalist Kyaw Soe Oo (C) talks to the media as he leaves after a court appearance in Yangon on January 10, 2018. Since the start of the military operation in August last year, more than 650,000 Rohingya had fled across the border to neighboring Bangladesh. The reporters’ arrests came just ahead of the release of the results of a survey by medical aid organization Médecins Sans Frontières (MSF; also known as Doctors Without Borders) which showed that a minimum of 6,700 Rohingya — including 730 children — were killed by shooting and other violence between August 25 and September 24. The report also claims that at least 2,700 others died from disease and malnutrition. The aid agency’s death toll far surpasses estimates from Myanmar’s government, which has put the figure in the hundreds. Press associations, officials from the US, UK and Canada, and the UN Secretary General have appealed for the reporters’ release. On Tuesday, former US President Bill Clinton added his voice to calls for the men to be freed. “A free press is critical to a free society – the detention of journalists anywhere is unacceptable. The Reuters journalists being held in Myanmar should be released immediately,” Clinton said in a tweet. A journalist was killed Saturday in the Mexican border state of Tamaulipas, and authorities said they were investigating to see if his death is related to his work. Carlos Dominguez Rodriguez was slain in the city of Nuevo Laredo across the border from Texas while driving in a car with relatives who were unhurt in the attack, state security spokesman Luis Alberto Rodriguez told The Associated Press. Rodriguez said the body had stab wounds and there may have been gunshots. The 77-year-old Dominguez had worked for different print media outlets, including the Diario de Nuevo Laredo newspaper, but he was currently an independent journalist who wrote opinion columns for news websites, Rodriguez and other journalists said. If it is confirmed that Dominguez was murdered for his work, he would be the first journalist slain for his profession in the new year after a deadly 2017 that saw at least 10 killed in what international press groups called a crisis for freedom of expression in Mexico. Earlier in January, a news editor was killed in Mexico City in a robbery apparently unrelated to his profession. Rodriguez said preliminary investigations indicated that Dominguez had not reported receiving any threats or requested security. Tamaulipas has been wracked by drug cartel violence, and the state is one where organized crime has often been able to intimidate media outlets into silence through violence and threats. Both the United Nations and the Inter-American Commission on Human Rights have expressed concern about the impunity surrounding the killings of journalists in Mexico. On Jan. 7, in Guerrero state in southern Mexico, several journalists reported being roughed up. Bernandino Hernandez, who has worked with the AP, said state police beat, kicked and dragged the journalists. MEXICO CITY (Reuters) – The Guatemala attorney general’s office confirmed on Saturday the arrest of congressman Julio Juarez Ramirez, who is accused of plotting the murders of two journalists in 2015. Prosecutors and investigators with the International Commission against Impunity in Guatemala said the politician orchestrated an attack on journalists Danilo Efraín Zapón López and Federico Benjamín Salazar Gerónimo, who were killed in March 2015. Juarez was arrested on Saturday morning near his home in the southern district of Suchitepéquez and transferred to Guatemala City, the capital of the Central American nation. He maintained his innocence as he reported to court on Saturday afternoon. Juarez served as mayor of the southern city of San Antonio La Union from 2012 to 2015, before winning a seat in Congress the next year. According to investigators, Zapon, who was a journalist for the newspaper Prensa Libre, was attacked because he was working on a story about corruption in the Juarez’s administration.